We're back from Tobago. Essentially it was a family holiday for us with lots of fishing thrown in. 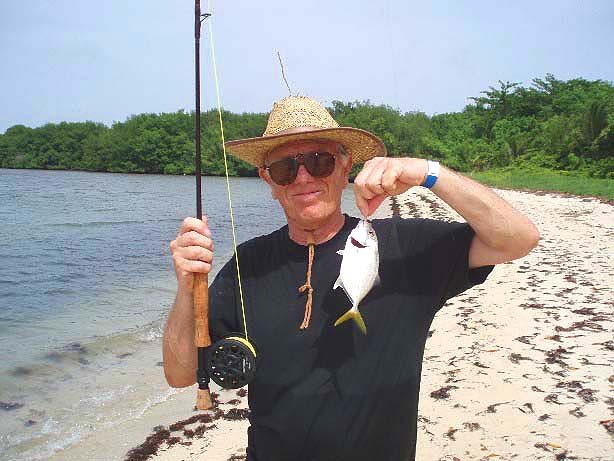 I get quite afew requests for information about fishing in the tropics so perhaps this is a good time to say a bit about how we approach our fishing trips. First and foremost I should say that we fish mostly from the shore - these days our use of guides and expensive boat sessions is rare unless there is no alternative. Essentially we try to 'suss out' the fishing in the first couple of days and then concentrate on what we find most interesting or productive. Generally we are armed with spinning gear (multi-piece spinning rods, fixed spool reels, thirty pound BS braid and lures armed with knottable wire traces) and fly gear (8-9 wt fly rods, floating lines, nylon casts and a variety of 'flies' on stainless hooks). In this case I was fishing with my son Richard and on the first sessions, to speed up the learning process, one of us spun while the other fly fished. 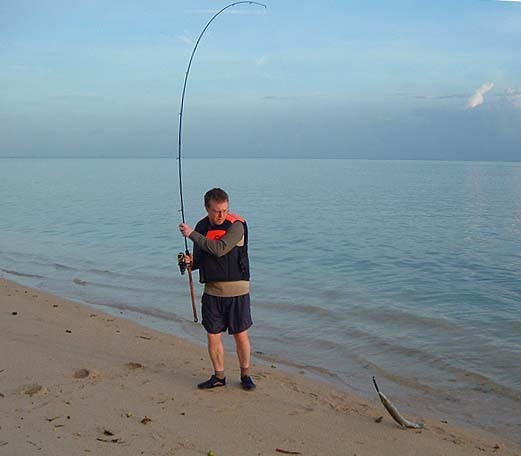 It was not long before Richard was into a barracuda on his Maria plug - no great size but a good start. 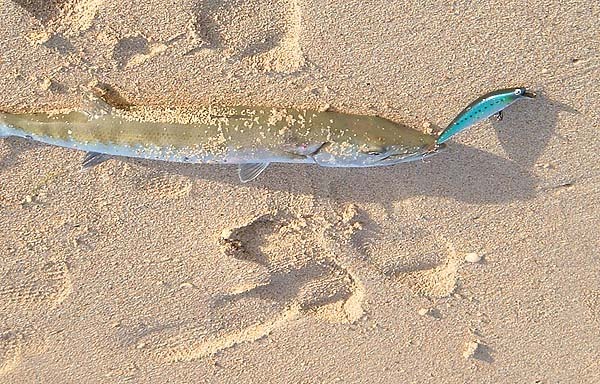 I was using a tiny whitish rubber eel fitted with metal 'eyes' to keep it under the surface and after a couple of missed bites I hooked and landed a palometa. 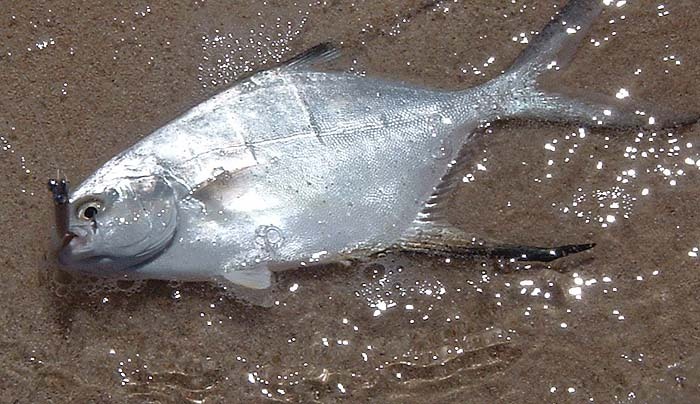 These aggressive little fish like to swim right in the surf line and can often be seen rushing up the beach with a wave and then darting back into the shelter of deeper water in the undertow. Our first couple of sessions produced a dozen fish between us and although nothing was huge we were well pleased to have broken our ducks. 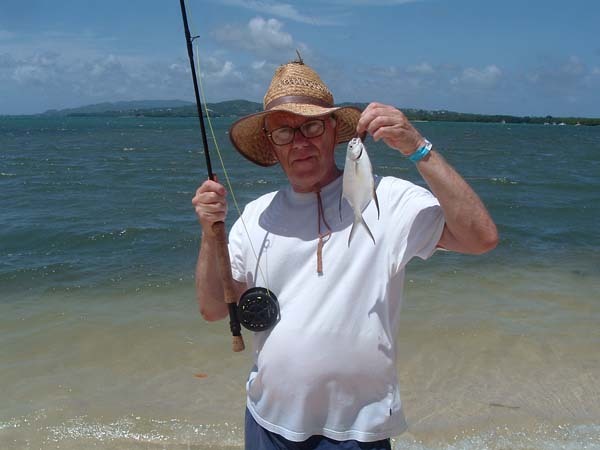 My pal Steve Hull has been over in Tobago for some months so I gave him a ring to find out what was doing. 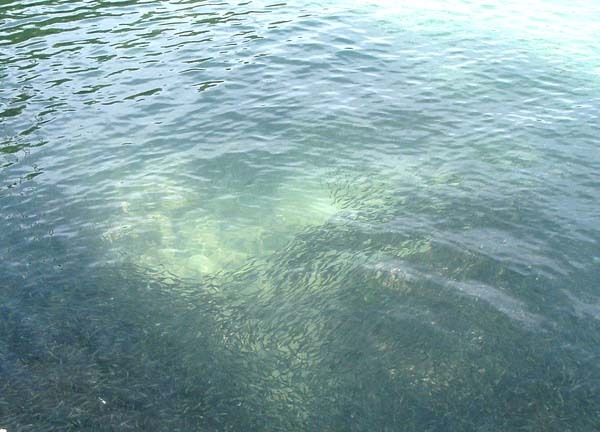 It seemed that there had been lots of tarpon showing off one of the local beaches and a number had been caught on livebaits. We joined Steve for a session to see 'how it was done'. He kept his livebaits (caught by use of his cast net) in a bucket with an aerator and float fished the livebait on a single hook on a heavy nylon cast. As it happened Steve had only a single bite which he missed but we'd had a good lesson in the tactics. Two mornings later Rich and me set up light paternosters with small hooks baited with bits of flying fish to catch a few livebaits. We had a number of six-inch croakers, captain fish and snappers in short order. These were popped into a cool box part filled with sea water and we drove down to the 'tarpon beach'. It was some time before we had our first (only) bite on my rod. The fish appeared to be well hooked on my circle hook and took off at a rate of knots. It was clearly a very large fish (probably a snook) and ripped line off against a tightly set clutch before eventually coming unstuck - I was gutted. The following morning we tried again and this time Rich hooked a big tarpon which he saw engulfing his snapper livebait - again it came unstuck. Disaster! We had one more attempt at livebaiting but this time no bites at all. The experiments will have to wait for another holiday. 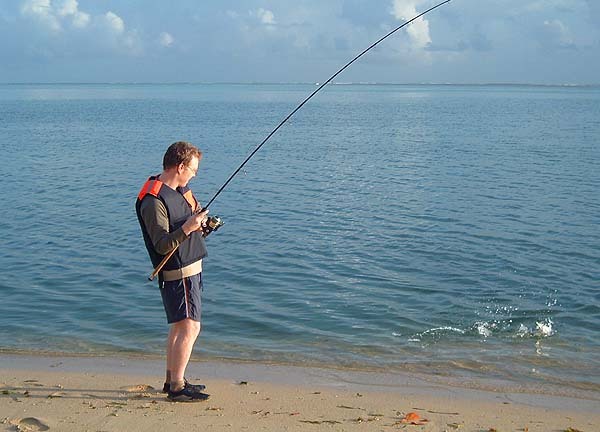 In relation to finding fish it is rare to have an informant when you go on holiday so what should you do to improve chances? Well the first thing to look for is bird activity. Diving pelicans, fishing terns, noddies, boobies and laughing gulls all show the whereabouts of bait fish. NEVER ignore these signs. 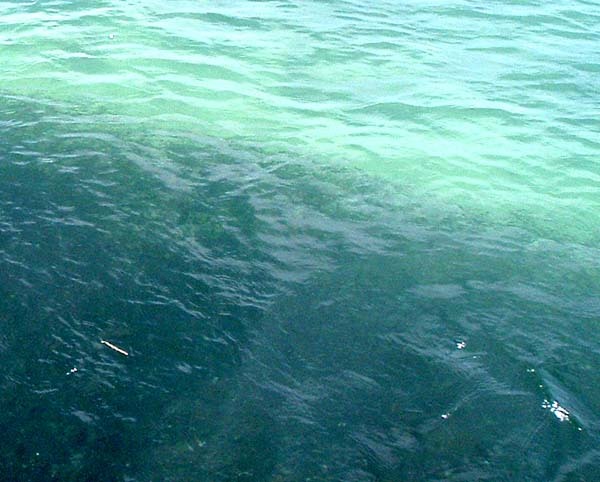 The bait fish shoals themselves are often clearly visible and once again are a strong indication of the presence of predatory fish. The absence of baitfish and birds doesn't mean that it's not worth fishing but EVERY TIME I would go for the spots where I could see birds or baitfish.